﻿ Disabled Swings - Adaptive Swings Seats for Special Needs children and adults. Huge range of adaptive swings to suite your needs. Full supportive swings like the Jennswing and Cubby II .and Australian made disable swing seats. Our range includes Infant high back disabled swings that you see in parks, Adult disabled swings with or without supportive frames, the All abilities swing seat thats a larger than most disable swings on the Australian market. Our range includes commercial playground swings for commercial use like the Birds nest swing and the all new special needs Basket swing chair designed for adults to swing on. We have a largest range of adult disabled swings and infant disabled swings to suite different special needs requirements including therapeutic swings and swing seats. 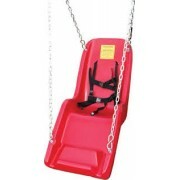 Adult Disabled Half Bucket Swing Seat with plastic coated chains.Includes harness and buckle. Suitab.. Adult Disabled Half Bucket Swing Seat with Steel FrameIncludes harness and buckle. Suitable for comm.. Adult Disabled Swing Seat with Frame and 2 x plastic coated chains by 1mt long Includes harnes..